I then told my history to Mr. Johnson, which he listened to with attention. I told him how I was a very strict Christian, and was turned from that to infidelity. But that now I had got back to a very agreeable way of thinking. That I believed the Christian religion; though I might not be clear in many particulars. He was very much pleased with my ingenuous open way, and he cried, “Give me your hand. I have taken a liking to you.” He then confirmed me in my belief by showing the force of testimony, and how little we could know of final causes; so that the objections of why was it so? or why was it not so? can avail little; and that for his part he thought all Christians, whether Papists or Protestants, agreed in the essential articles, and their differences were trivial, or were rather political than religious. One of the most famous parts of this journal, or of any of Boswell’s journals, is his initial meeting with Samuel Johnson, who would become a great friend and mentor to Boswell. This particular journal also happens to be the one that is most widely available. Many of his more than thirty years worth of diaries are available only if you hunt for them, or are willing to pay a high price (Abe Books is the place for used volumes no longer in print). I’m slowly, but surely collecting all of Boswell’s writings (B&N has several free e-texts, happily, though only of his travel journals and the Life of Johnson). What fascinates me about this exchange with Samuel Johnson is the way Boswell reveals his heart for Christianity, as well as his willingness to question his faith. In his journal at large, he also reveals his failure to adhere to any moral convictions. Boswell regularly falls into fits of melancholy, picks up prostitutes in back alleys, and then ends his weeks of despondency and hedonism by sitting in church pews or having meals with the stalwart Johnson. My obsession with James Boswell is difficult to explain, but it has something to do with his paradoxes, which get at the heart of the human condition. Boswell defines himself as an outsider, even while supping with numerous friends and literary acquaintances. Boswell tells the truth about himself, even when the truth is repulsive. But mostly, I appreciate him because he’s the embodiment of the Bible verse, “The spirit is willing, but the flesh is weak” (Matthew 26:41). 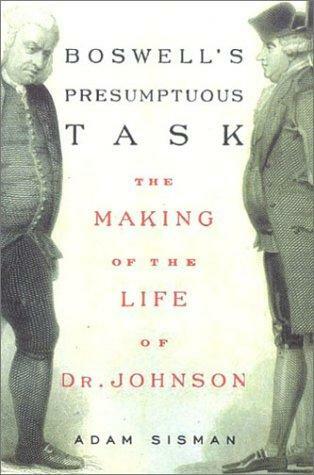 For that, Johnson, who was no less human than Boswell, but was more mature, was a stable influence in Boswell’s intellectual world. And–as an image of Johnson’s maturity–I’d like to highlight this sentiment of his: for his part he thought all Christians, whether Papists or Protestants, agreed in the essential articles, and their differences were trivial, or were rather political than religious. Thank you, Mr. Johnson. I find the unity movement of Christianity to be a tiresome affair–a tiresome, political affair. I’m frustrated when those involved in this movement highlight the differences between denominations and desire to bring all Christians together under one banner. The differences, according to Johnson, are trivial. They’re trivial enough that the gospel continues to go forth, despite the lack of unity. As far as Boswell’s soul, I can’t make any claims about it. I can only read his words and surmise and feel wretchedly bad at his depravity, his honesty, and his continuous attempts at bravado, despite his overarching humility and lack of confidence.